With so much activity around your front door, it requires smarter home security technology to keep it secure but also convenient to access. Migrafill gives you even more awareness and control of front door activity with a Wi-Fi Doorbell Camera to enhance your front door security. The smart doorbell camera is completely integrated into your smart home security system, letting you see who’s at the door whether you’re home or not, have a two-way audio conversation with visitors through your mobile app, and even unlock your front door’s smart lock from the same screen. Once installed, the smart doorbell also becomes a smart home security camera, able to record and send you motion-detected or doorbell-activated clips, or clips triggered by other devices like your garage door. Its motion sensor can also trigger other devices, such as your porch lighting, to deter potential intruders. Professionally installed and configured, and completely integrated into your Migrafill designed smart home, the Wi-Fi Doorbell Camera is available this spring. Global trends indicate an increase in the number of house burglaries and break-ins each year during daytime hours. Whereas traditional security systems activate once a break-in has occurred, the Ring™ Video Doorbell is designed to help you prevent a break-in from taking place at all. 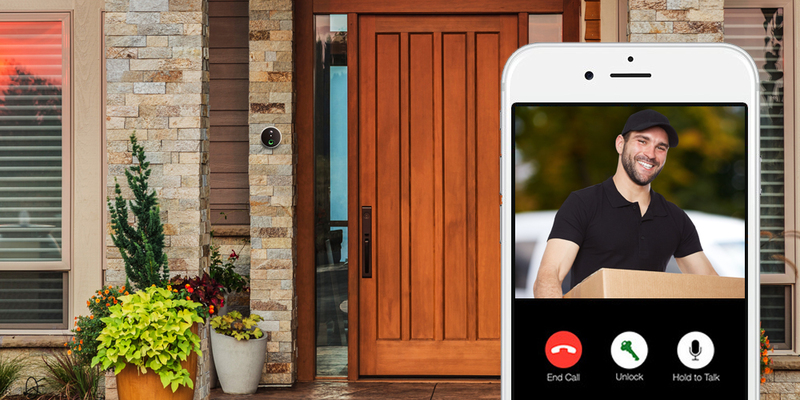 Answer the door from anywhere using your wireless video doorbell. With Ring, you’re always home. Chime is an extension of your Ring Doorbell, letting you know you have a visitor even when your phone is in the other room. Receive instant alerts when someone presses the button on your Ring® Video Doorbell or motion is detected, via the free Ring® app (iOS® and Android™). See and speak with visitors from anywhere using your smartphone, and watch recorded footage anytime with Cloud Recording. Not everyone presses the button on your video doorbell, so we’ve included motion sensors to alert you of activity at your home. Any movement triggers an alert via the Ring® app and activates the night vision HD camera. Connect the Ring Doorbell to your Wi-Fi network using the Ring™ app, then mount the unit using the tools included in the package. It only takes minutes; no professional help or special tools required. The Ring Doorbell attaches to its mounting plate using a proprietary screw for security. Sign up & convert your account today to get a discount!